What follows are some of the ways that trade show exhibitors can make their stands stand out - as demonstrated by this year's IBC exhibitors. Please note no judging panel or method or fair assessment was used to determine which exhibitors were chosen to feature in this piece - stands were selected purely on their ability to distract me from the pain of each step, as I wondered the halls in shoes I should know better than to wear to a trade show. Dell's on-stand magician was the perfect combination of entertainer and product promoter. He drew the crowds in with his charismatic magic show and cleverly weaved product references into his performance - even managing to sound like he understood the technology! The mobile phone wide-angle lens adaptor that he gave away at the end of the show was an added bonus. EVS dedicated a big chunk of stand space to their #EVSlamDunk Experience - with basketball court action being used to demonstrate their technology's sports application. The first time I walked past, the basketball court was deserted while the rest of the stand was packed but the following day was a different story, with demo action in full swing. Either way, the stand attracted my attention on both days. It's always interesting to see the camera demo areas at IBC - these displays need to not only attract attention but also need to be used to demonstrate their products' capabilities. This year the displays ranged from a flower shop to a Turkish ice-cream stall and motorbike workshop. While they were all eye-catching, Atomo's cocktail bar was definitely the most entertaining. A guaranteed way to stand out from the crowd is to look completely different to everyone else. At a tech trade show, that probably means going rustic with your design. Google's took this to the extreme while Ooyala's coffee shop-meets-tv-bar was refreshingly different while still being relevant - bagging an award for best smaller stand design at the show. Dramatic lighting can be a very effective attention grabber - especially in dark trade show halls. Anvato and Media Excel's stands played off each other brilliantly with contrasting lighting effects. Riedels' granny campaign is a fun take on technology, but I have it on good authority that even they didn't expect their life-size cardboard cutout to become a selfie-magnet. They made the most of the opportunity by adding their hashtag and name to the speech bubble - making sure every selfie was branded. Some products are eye-catching by nature. 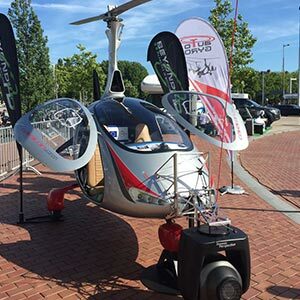 You couldn't help but notice the brilliant green chroma key paint on Pro Cyc's stand, the video walls on the likes of Sceo and HDQLINE's stands or the gyrocopter that Beyond HD brought to the show. Perhaps more impressive, though, are the exhibitors that are able to create showstoppers with products that aren't intrinsically display items. Omni remotes wall of remote controls and Autucue's on-stand messaging were a couple of the more creative product displays that caught my eye. Trade shows can be an assault on the senses - with countless brands vying for your attention at every step. The key to trade show display advertising is to making sure you stand out from this visual noise by owning the space you're advertising in. Riedel achieved this with scale and simple design, Tivo through repetition and Blue Lucy by taking advantage of a space where there was no competition. If the popularity of the beach bar didn't give you an insight into what attracts a typical IBC visitor, then the number of exhibitors that incorporated bars (both of the caffeinated and alcoholic variety) into their stand designs should. There were also a lot of free pens and snacks on offer but, while I know that a lot of exhibitors offered gifts and giveaways to people on their stands, only BFE and Quantum actively approached me with a giveaway designed to entice visitors to their stands. There's no magic formula to getting your stand noticed at trade shows - but if you're brave enough to do something different, you'll stand out from the crowd. On that note, a special mention needs to be made of the cameraman who blagged his way into the press room under the pretence of using the lift, whipped out a megaphone and delivered his sales pitch to a room full of journos. He deserved a front page feature.